As many as 36 million people in the United States have some form of arthritis or joint inflammation. It is a major cause of lost work, time, and serious disability for many people. Although arthritis is mainly a disease of adults, children may also have it. Bursitis/tendonitis, and various sprains and strains may also imitate arthritis. Accurate diagnosis requires a careful history and physical examination, as well as x-rays of the involved area. Treatment is dictated by the proper diagnosis, location, and severity of the condition. Our orthopedic surgeons are specially trained to provide appropriate care including medications, techniques to protect the joint, and when appropriate; surgery for the afflicted area. The three most common types of this condition are osteoarthritis, rheumatoid arthritis, and psoriatic arthritis. Osteoarthritis is the wear and tear that occurs to many joints over time. It has many different causes but the most common occurrences are from joint injury or obesity. Rheumatoid Arthritis occurs when the immune system attacks the joints of the individual. There is disputing evidence as to why the body does this, but it results in inflammation and joint damage if it isn’t treated. Psoriatic Arthritis occurs in people that have a skin condition called “psoriasis,” which is an inflammation of the skin. 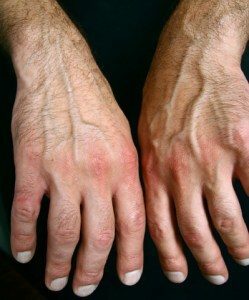 While rare among psoriasis sufferers, this type of arthritis can cause swelling in the fingers and toes, and causes pain in select joints. Where do People Get Arthritis? To minimize the damage caused from arthritis, it is important to diagnose it early. Each case is different depending on the individual, so treatment varies. If you are diagnosed with arthritis, our doctors will discuss your treatment options with you. Proper treatment may include changes to your activity, diet, and possible surgery. To learn more, or to schedule an appointment contact Washington Orthopaedic Center today.